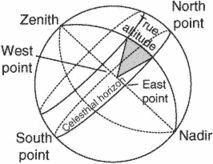 (also, absolute altitude), in geodesy, the distance along a vertical from a given point on the surface of the earth to sea level. It is determined by leveling. In the USSR, true altitude is calculated from zero on the depth gauge in Kronstadt. i. The actual height above sea level. The calibrated altitude corrected for air temperature. See altitude. ii. The actual altitude of a celestial body above the celestial horizon. The observed altitude must be corrected for several variables before it becomes the true altitude. True altitude is similar to absolute altitude, but instead measures our distance above sea level. Even with the correct altimeter setting your barometric altitude can differ from your true altitude by as much as 10 percent. Airport, terrain and obstacle elevations on aeronautical charts are true altitudes. Colder, denser air at a given pressure level results in a decrease in true altitude. Absolute altitude is the height above terrain computed by subtracting terrain elevation from true altitude. Remember that heavy smokers can increase their true altitude by 5000 to 8000 feet when considering oxygen use and TUC. In practice, nonstandard temperatures affect all aircraft equally, so all aircraft at an indicated altitude will still be on the same horizontal plane, even though the true altitude of that plane shifts with temperature. Watch your step(down): having a glideslope to follow always feels better than being without one. But if you intercept the glideslope early, you must adhere to any stepdown fixes prior to the FAF ... right? Altitude is true altitude (your actual height above sea level) as determined by your GPS position and is quite accurate even when compared to a properly set altimeter. can make the indicated altitude higher than true altitude. The FB Winds are provided to pilots at true altitudes every 3000 feet through 12,000 feet and pressure altitudes every 6000 feet at or above 18,000 feet.